As stated in the video, you need to be aware of what your periodontal pocket depths are. These measurements should be made by your dentist or hygienist at every office visit. They should write them down on a chart for you that you can take home with you. Doing so will help you to see where you are at and where you need to go. Where do you want to be? Answer: At 3mm and below everywhere. You don't want anything above 3mm. Some professionals think that a 4 is ok on the very back molars because the tissue is a little different there. However, 4 is definitely not ok in the front of your mouth. To make it easy, I think you should shoot for 3 and below everywhere. Once you have achieved that and are able to maintain 3 and below, most dental professionals will say your gums are healthy at that point. All you have to do from that point on is maintain. You can breathe a little easier because it will be very unlikely that the bad bacteria have sufficient numbers to damage the tissue that supports your teeth. These numbers are very important to you. Once you know what they are you are empowered to move forward. You have a starting point. That is far better than trying to guess what is happening in your own mouth. Get those numbers and watch them like a hawk. 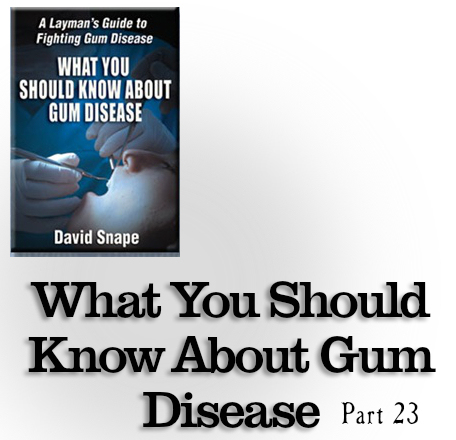 * I speak in general terms here and specific questions about your unique dental health situation should be asked of your periodontist or dentist.